Clean, shine, and protect in one easy step! Use on fiberglass, gel coat, chrome, aluminum, decals, countertops, appliances, and more! Owning a boat or RV is a great reward for your hard work, so why would you want to work hard maintaining it? McKee’s 37 Marine & RV Final Step Detail Wax simplifies your maintenance routine so that you can spend more time enjoying the open water, or the open road. This incredible formula cleans shines and protects all of the hard surfaces in and around your boat or RV and it’s formulated to do so without streaks or smears so that you can enjoy a clean glossy surface without the headaches! McKee’s 37 Marine & RV Final Step Detail Wax is so easy to use, you’ll wonder how you kept your boat or RV clean before. 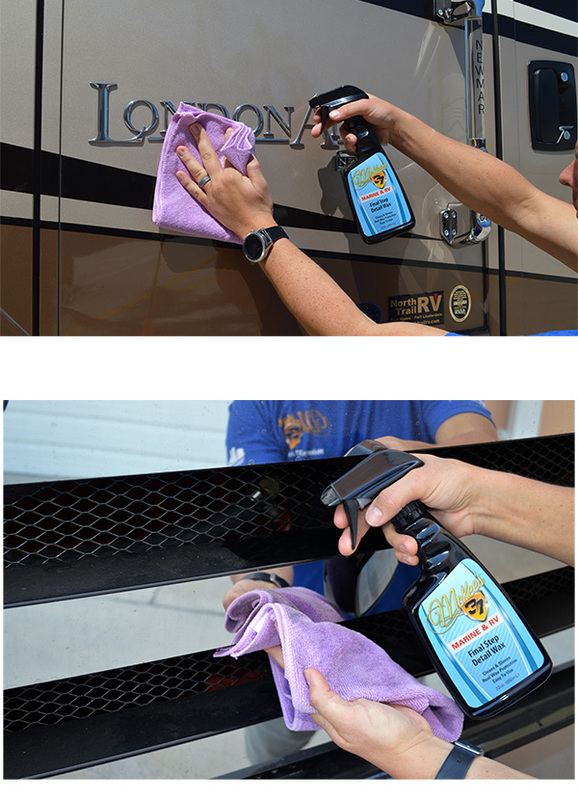 Simply spray it on and buff it off — that’s all it takes to make your boat or RV look like you spent all day detailing it! McKee’s 37 Marine & RV Final Step Detail Wax makes it easier than ever to quickly clean and protect your boat or RV. Spray a liberal amount of product directly onto surface and wipe clean with a plush microfiber towel. Use a second clean, dry microfiber towel to buff the finish to a high gloss. Tip: Use as often as you wish – this formula will not build up! Marine & RV Final Step Detail Wax 128 oz.